The Federal Energy Regulatory Commission (FERC) is an independent agency regulating the interstate transport of energy. As innovations and changing consumer preferences reshape the energy industry, FERC must grapple with key issues. 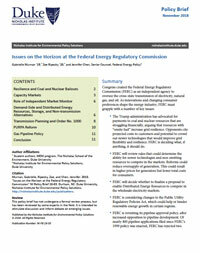 This policy brief summarizes pending issues before FERC, including grid resilience, market reforms that would affect newer technologies and non-emitting resources, and transmission and gas pipeline infrastructure build. How FERC decides on these issues would impact consumer costs, determine which resources would receive revenues from FERC-regulated markets, help shape infrastructure investments, and affect the costs of decarbonization policies.